It’s Wednesday! We’re HALFWAY through the work week!!! I’ve been thinking about some of the fundraising I’ll be doing for the Chicago Marathon as part of Team PAWS. I really, really appreciate the comments from Cheryl, Jess, Jenny and others who have said they would be happy to donate! Adorable photos from Team PAWS Facebook Page. 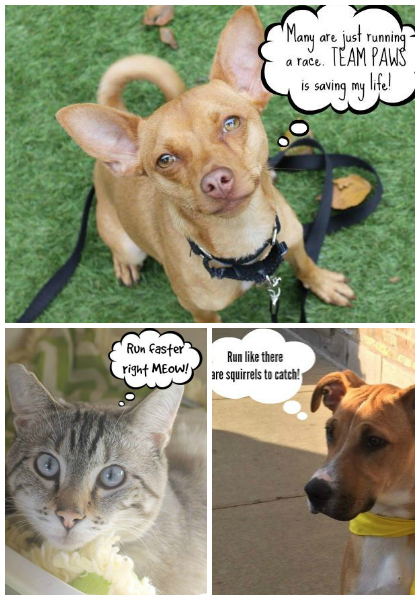 To encourage more runners to give to this important cause I’m considering hosting a virtual 5K or 10K to help raise money for PAWS Chicago, the no-kill animal shelter I’m running for. 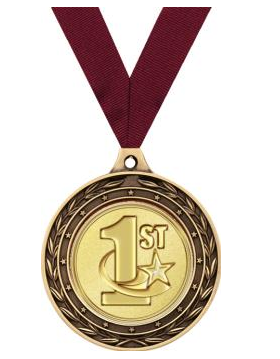 For those willing to submit their times after the race, I could even send out special 1st, 2nd and 3rd place medals adding a fun competitive element to the race. All of the costs associated with having the medals created and mailed would be covered by me, ensuring that the full donation you make for entering the virtual race would go directly to PAWS Chicago. Before I put down any money towards the medals, I’d like to get a sense for whether anyone would even be interested in participating in a virtual race to help homeless dogs and cats. If you would just take a second to vote in this anonymous poll I would really appreciate it! I’d also welcome feedback on the donation amount you’re willing to give. Right now I’m thinking about $20, but if that seems too high (or low) let me know in the comments please. 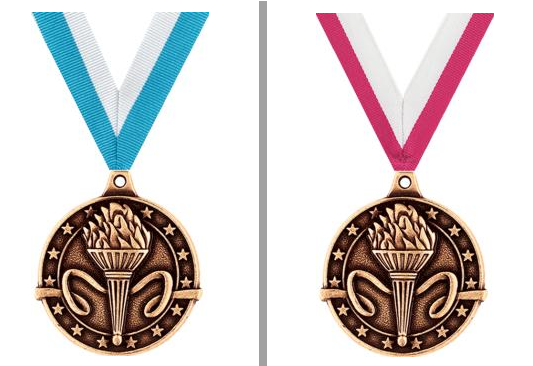 Also let me know if you like or dislike the medal design and I can go back to the drawing board! I’ve participated in virtual races for others who are fundraising and they can be a lot of fun if done right. We can use Instagram, Twitter, Facebook, etc. to follow along with each other’s races and cheer each other on! Of course if you have a doggie it would be SO PERFECT if you ran the virtual race with him or her and shared those pictures via social media! I might finally get Cecil that jogging stroller I’ve been thinking about so I can take him out for a spin! Thank you in advance for voting and for commenting with any ideas/feedback/suggestions! I’m on board. We should chat because we have hosted about four virtual runs so far and that usually turn out great. Let me know if you have any questions. This is a great idea to help with fundraising. That would be great! I am going to send you an email this weekend! What a creative fundraising idea! I’m all for it! This is a great idea. I know that while I have been trying to collect donations for St. Jude for my first marathon, nobody wants to donate. I have posted on my facebook, twitter, blogged about it and the only people that have donated were a couple co workers. It is truly sad how many people think its a great idea until it comes to actually donating. I know I would gladly donate to your cause!! I know what its like to not get donations so I try my best to help others. You should add a little widget to your blog sidebar if they provide one. I don’t remember seeing your St. Jude link in the blog but I will definitely donate. I think other runners will support you! That’s a great idea. I would participate! Thanks Molly! I’m excited about planning it. I hope that others are interested too! I’m the same way, I only participate in virtual races if they benefit a cause! I’m excited that you would participate! Yay! What a fun idea! I’d love to participate in a virtual race! I’m not much of a medal person (literally don’t know where most of mine are), so I’d happily skip that. $20 seems very reasonable to me, and I assume that people can always give more if they want to. Thanks for the feedback Lizzy! Yes, I’m going to add a little area to the sidebar of the blog where you can donate whatever amount you want at any time. I just need to work on that! Is there an option to just donate without running the race? 🙂 I think it’s a great cause and I am more than happy to support you and Team PAWS! I am in! I would take it one step farther and instead of a medal how about the winner gets a bag of pet food donated to a shelter in their honor? Oh I LOVE that idea! Thanks Cheryl! I’m so glad you would be a part of it! What a great idea. I think $20-25 is a great amount. If you nix the medals you could just open it up and let people pick whatever amount they can do. Hey Kim, great idea! I’ll definitely allow participants to donate as much as they would like, with a minimum of $20 or so to be a part of the race “festivities” 🙂 So glad you would join in! I might need to create an ultrarunner division for you! this sounds like an awesome way to raise money! i’ll definitely participate. and, another fun thing: f i get entry through the lottery, i’ll be fundraising for team paws, too! Hey Brittney, how exciting that you’re thinking about joining Team Paws! So far I’ve had a really great experience with everyone I’ve spoken with there! Hey Jenn, that makes a lot of sense to me! I know EXACTLY how you feel and will definitely keep that in mind in putting together the virtual race! I’m down like a clown! 5K’s make me tired and then leave me feeling like I “only” ran 3 miles. I would totally do the 10K option. $20 is a great entry fee ESPECIALLY if it’s for the kiddos (pet kiddos that is). I agree NO NEED for medals but it would be sooo fun to see a picture of me and my pug Pete on your blog. We would both run in honor of our beloved Chyna rottie girl who passed away in 2007. YES! I am the same way with 5Ks! I’m dead at the end but five minutes later I want more! I can’t wait to feature you and Pete on the blog 😉 I love rottweilers, I bet Chyna was so pretty! That is so amazing of you.!! To think of doing something like this is so sweet. I would love to run this virtual race. I’m all in.!! I think it would be such a fun thing to do for everyone who has a pet or just loves animals! It’s been great catching up with your posts Kristina! I’m really on board with this idea, I think it’s a great way to connect the running community as well as raise awareness for a great cause 🙂 $20 seems like the right amount I think. I’ve never heard of a virtual race before, I love it!